Viruses spread by mosquitoes continue to dominate the headlines. Dengue remains a concern in Singapore and other countries in South-east Asia and Latin America, and the threat of the Zika virus spreading to the region is very real with the coming Olympic Games in Brazil. Another mosquito-borne disease, chikungunya, continues to lurk in the background. Worryingly, a recent outbreak of yellow fever in Angola in Africa, caused by yet another virus spread by the Aedes mosquito, affected 1,708 people with 238 deaths. The outbreak created concern in China when some infected Chinese workers returned to their home country. Evidence is mounting that Zika is linked both to the Guillain-Barre syndrome and the birth defect microcephaly (abnormal smallness of the head) among newborn babies, causing concern among expectant mothers. Experts at the United States CDC (Centres for Disease Control) have stated that there is no longer any doubt that Zika causes microcephaly. Senior Minister of State for Health Amy Khor said it was almost inevitable that the virus will reach our shores, and, as if on cue, Singapore reported its first case of imported Zika infection last week. By extension, the threat is also likely to spread more widely in South-east Asia and the threat may be "scarier than we initially thought", according to Dr Anne Schuchat, principal deputy director of the CDC. The continued hot weather, with Singapore recording its hottest day last month, may increase mosquito numbers and result in a big outbreak of dengue and possibly other mosquito-borne diseases. Dengue cases in Singapore in recent weeks seem to be declining, with only 176 cases reported last week, May 8-13. In the Philippines, the first 150,000 children vaccinated with a recently developed dengue vaccine showed few ill effects, vindicating the government's decision to immunise one million schoolchildren. At the same time, the World Health Organisation's Strategic Advisory Group of Experts (Sage) on immunisation recommended at its meeting in Geneva last month that countries with high dengue prevalence should consider approving and using the new vaccine expeditiously. Sage also recommended that vaccination should be part of an integrated prevention and control strategy which includes controlling the mosquito vector and social mobilisation. The recommendations represent an important recognition and endorsement of the public health value of the dengue vaccine, and provide countries with justification for its introduction. Another promising vaccine is about to undergo extensive clinical testing in Sri Lanka. Professor Tikki Pang, 64, has been a visiting professor at the Lee Kuan Yew School of Public Policy since 2012. Based in Singapore and Geneva, Switzerland, Prof Pang holds Bachelor of Science (Honours) and PhD degrees from the Australian National University in Canberra in the fields of biochemistry and microbiology/ immunology. In these areas, he has published more than 300 scientific articles and 12 books, edited volumes and reports. They include major World Health Organisation (WHO) reports, including Genomics And World Health (2002), the World Report On Knowledge For Better Health (2004), and the World Health Report 2013 On Research For Universal Health Coverage. In 2014, he was appointed chair of the board of the South-east Asia Community Observatory - a community-based research platform by Malaysia and Monash University in Australia that looks at research in the clinical and biomedical sciences, social sciences, economics, education and environmental sciences. Prof Pang was director of research policy and cooperation at the WHO from 1999 to 2012. He was also co-director of its Collaborating Centre for Dengue and Dengue Haemorrhagic Fever at the University of Malaya in Kuala Lumpur from 1982 to 1995, and a member of the WHO technical advisory group on dengue in 1986. He is currently a member of the WHO's expert panel on health and the environment. HOW PREPARED IS SINGAPORE TO DEAL WITH FUTURE THREATS CAUSED BY THESE VIRUSES? Based on extensive and valuable experience gained during the Sars outbreak in 2003 and other outbreaks in the region caused by avian influenza and Mers-CoV, Singapore is arguably well-prepared and ready to deal with future threats from infectious disease epidemics. This capacity is grounded in five areas that Singapore has done well. • Continued surveillance and monitoring for these viruses are the vanguard of preparedness and the critical first step for implementing a rational public health response. Singapore has a well-established and highly sophisticated monitoring system, backed up by strong capabilities for rapidly diagnosing disease and infection caused by these viruses. The Ministry of Health and the National Environment Agency (NEA) recently unveiled control measures to reduce the threat of Zika, with early detection of cases as a key strategy. • Good clinical care and management of those who become ill have allowed Singapore to keep its mortality rate for dengue at very low levels. This is related to good knowledge and awareness among physicians to recognise dengue, for example, and the excellent healthcare facilities to treat severe cases which require hospitalisation. • Singapore has made significant investments and has been successful in implementing various strategies for controlling the mosquito vector of these viruses, specifically the Aedes mosquito. 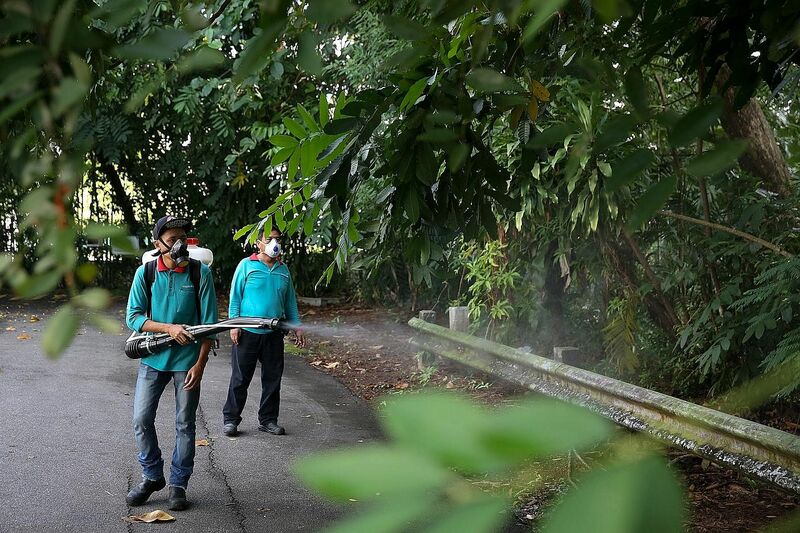 Emphasising environmental cleanliness and deploying source reduction methods such as pesticides and fogging have brought Aedes numbers to very low levels. These efforts have been supported and complemented by tough legislation which, for example, recently extended the $200 fine for breeding mosquitoes in houses to premises in non-dengue hot spots. Singapore is also taking the lead in testing novel vector control methods, for example, with the use of male Wolbachia-infected mosquitoes in a field study recently announced by NEA and to be conducted at the end of the year. • The Republic has been very successful in developing and implementing public education, awareness and engagement programmes. Intensive media and grassroots campaigns to promote the five-step Mozzie Wipeout campaign, community- based "dengue fighters" and a community alert system are just three examples of social mobilisation in the fight against dengue. In addition, a knowledgeable and responsible media is a critical component for effective risk communication to a public currently concerned with Zika arriving here. • The Republic has made impressive investments and commitment to pursue more research to develop better tools to control dengue. It is home to the Novartis Institute for Tropical Diseases, which is working on research tools and approaches, including discovering new treatments and establishing dengue animal models, a critical, and so far missing, research tool. The National University of Singapore and the Duke-NUS Medical School are investigating whether proteins in the saliva of infected mosquitoes may present good targets for future treatments and vaccines. With regard to the Zika virus, a Duke-NUS research group recently uncovered important insights into its structure and behaviour, which may have important implications for developing treatments. This complements recent advances in research in the US, China and Brazil which showed that mice infected with Zika developed microcephaly. Singapore has established an enviable track record to deal with disease outbreaks, one that many countries hope to emulate. Its success is based on being well prepared and believing in what Benjamin Franklin once said - that "by failing to prepare, you are preparing to fail". However, there is room to do better, and to invest and commit to additional strategies on the threats posed by these viruses. It is encouraging to note that the Health Sciences Authority is speeding up its evaluation of the new dengue vaccine, with approval expected within the next six months. The highest priority must be given to protecting the health of the people.